For months, This Song Will Save Your Life has been waiting on my shelf, lost amongst the other contemporary titles that are also unread. Desperate for a quick-read, during a break from A Song of Ice and Fire, I decided to pick this up. I loved it. "You think it's so easy to change yourself. You think it's so easy, but it's not." All her life Elise Dembowski has been an outsider. Starting a new school, she drams of fitting in at last - but when her best attempts at popularity fail, she almost gives up. Then she stumbles upon a secret warehouse party. There, at night, Elise can be a different person, making real friends, falling in love for the first time and finding her true passion - DJing. It's difficult to do a book like This Song Will Save Your Life justice. This novel is both powerful and poignant; the author tackling issues including self harm and suicide with ease throughout. Sales is able to create an honest and heart-wrenching novel, one that is a must-read for those struggling on the sidelines, written with an understanding of teenagers - and how we really feel - that I have never read before in YA. Whilst challenging us to accept ourselves, this also has hints of humour, creating light-hearted moments amidst the serious topics that are dealt with in Leila Sales' most recent release. Elise, the protagonist, is desperate to be someone else. She wants to have a friend to eat lunch with; somebody to talk to; a seat in the middle of the bus. Simply, she doesn't want to be alone. And I could recognise these feelings as being similar to my own. This Song Will Save Your Life begins a few days before schools starts, with Elise studying how to become popular, having never been able to fit in. And, as she took notes on how smiling at a person will make them like you, I realised how relatable character; one whose problems are not sugar-coated. I loved her character; the conflicting personalities she had, from how she felt in school compared to Start(the warehouse nightclub she stumbles across). Her character's voice is smart and sharp, with added wit, her story capturing what it feels like to find somewhere you belong. Start is introduced a few chapters into the novel; and this saw the addition of vibrant and fun characters to the plot. The rock star outfits, rhinestone pumps and packed dance-floor create Start, the crowd inside it made up of DJs, singers and band members. With this came Vicky, Pippa and Char, and Sales was able to show us that they were human. Just like Elise. Away from Start, I really liked how Elise's parents and siblings were written-into the novel; especially when I was reading about how they reacted to her giving up. It was great to see that how parents are affected in these situations wasn't avoided. Leila Sales' writing is unflinching; the author handling current issues, such as bullying, that affect many young people, honestly. There was no glamourising, and as a reader, I really appreciated that. In some YA novels, it can feel like tough-topics are thrown in, but This Song Will Save Your Life could challenge multiple self-help guides instead. I cannot praise Leila Sales enough. Whether Elise is feeling angry or frustrated, upset or uneasy, Sales is able to execute it, and I loved how 'real' her characters felt. There are life lessons to be learnt in this novel, with quotes from the characters written down amongst those from other favourites. Music plays a huge part in this novel, the author introducing me to Blur and Oases, the novel filled with songs from most decades on the set-list at Start. Elise's knowledge of DJing, and how it was written, was never over-complicated, so amateurs - like myself - could understand, and the novel still be believable. Overall, I cannot praise this novel enough. It's honest, heart-wrenching and has the right amount of humour, making this a novel I loved. 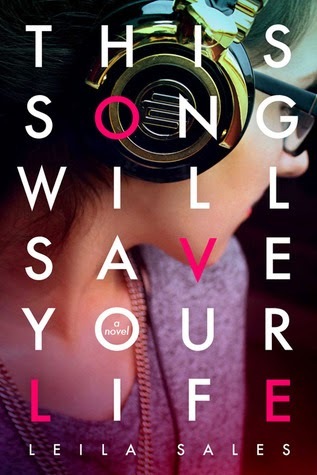 So, have you read 'This Song Will Save Your Life'? Have you heard a Blur song before(unlike myself)? Wow, I've never read a bad review for this book. :) I will definitely have to check this one out at my library!